Linda Livingstone, the dean of the School of Business, has prioritized supporting women and minorities in her one year as dean. This is the seventh in a series of profiles on GW’s 10 deans. From visiting the White House for a conference promoting women in business to traveling to Turkey to meet prospective donors, the dean of the School of Business is easing into her role leading one of GW’s largest schools. 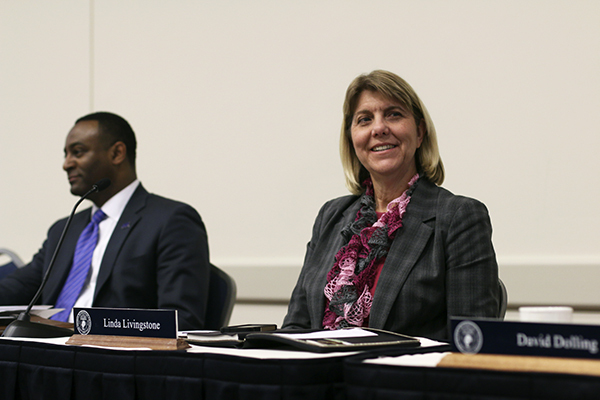 Linda Livingstone, the dean of the School of Business, has prioritized preparing women and minorities to start careers in business since she came to GW last fall. Over the past year, she has set the school in a direction she believes will empower minority groups to overcome obstacles like entering a highly competitive workforce. Livingstone came to GW at a time when the business school had been recovering from a $13 million debt, brought on by the school’s former dean. Livingstone has switched up the leadership in the school, most recently by hiring two new associate deans to lead the graduate and undergraduate programs. She also worked with officials to create an eight-year debt repayment plan. She has also created three task forces to explore the school’s future options. A new strategic plan, which focuses on exploiting GW’s location, international presence and varied courses, will be released this year. “There’s a variety of things going on that we feel are really important to help support our women students to help prepare them effectively for the opportunities that they’ll have in business and to make sure that they’re getting those opportunities as they go through our program,” Livingstone said. GW’s business school teaches more women than most of its peers, a population that can struggle to make it in a largely male-dominated industry. About 40 percent of GW’s master of business administration students are women, Livingstone said, a figure that’s slightly above the U.S. average, according to the most recent data from the Association to Advance Collegiate Schools of Business, which accredits GW’s business school. 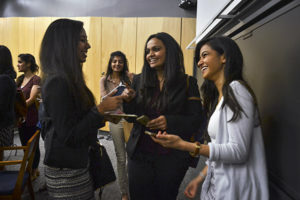 Tiyana Hossain, left, Nikita Jain, center, and Sanchita Bose, right, gathered for a screening for “Girl Rising” at the Milken Institute School of Public Health last week. Livingstone’s focus on making women and minority groups comfortable in the business world comes from a larger push to make the workplace more inclusive. Faculty in the school are “thoughtful about co-curricular and curricular content” for undergraduate and graduate students, she said. “Across all of our programs, what we want to try to do is ensure that the learning experience that the students have helps prepare students to work in a diverse work environment, whether that’s the undergraduate level in our curriculum and experiences or at the graduate level,” she said. William Handorf, a finance professor, said Livingstone is “a very pleasant person, a very knowledgeable person and a very articulate person,” – qualities that make her stand out as a leader on campus. Handorf added that she’s promoted many women in the school to senior-level positions, including Isabelle Bajeux-Besnainou, the school’s previous associate dean for undergraduate programs. “I would say actions speak louder than words,” he said. Livingstone has also attended conferences at places like the White House to promote women in business. She joined 45 other business school deans from around the nation to sign on to a plan to support women in business at an event this summer. Alison Davis-Blake, the dean of the Ross School of Business at the University of Michigan, and one of the deans at the White House conference, said in an email that Livingstone “has it all” and has made it a priority to prepare students for a diverse workplace. GW expanded its relationship with the Forté Foundation this fall, becoming one of 10 schools to join a pilot program to help undergraduate women prepare for jobs, called the “Rising Star” initiative. The program includes a specific curriculum for undergraduate women with built-in career advice, resume building and networking opportunities. Mark Klock, a finance professor, said faculty appreciate Livingstone’s “positive” and “upbeat” approach and he’s noticed that the business school’s focus on women began before Livingstone came to the school last year. “I believe that it wasn’t something that was done strategically, but I think people saw the opportunity to capitalize on that and build a reputation for being a good place for women in business,” Klock said.